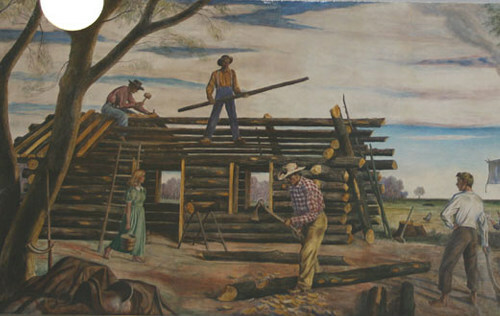 Our special thanks to Marilyn Tomalavage who sent in these photos (see letter below) of the two extant murals of a group of three painted by New Mexico native Peter Hurd in 1940. 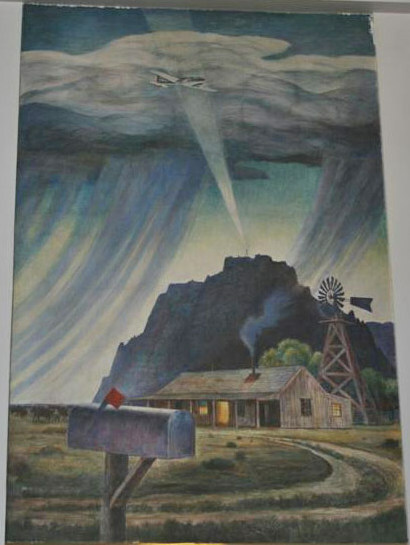 The missing mural was called �Eastbound Mail Stage� which probably matched �Airmail Over Texas� in size and shape. Hurd, who studied under famed illustrator N. C. Wyeth (Andrew�s father) married into the Wyeth family. He later became a war correspondent for Life magazine and in 1969 painted what was to have been the official presidential portrait of Lyndon Johnson. Johnson wasn�t pleased with the likeness and said as much at the unveiling. It has since become part of the National Portrait Gallery at the Smithsonian Institution.